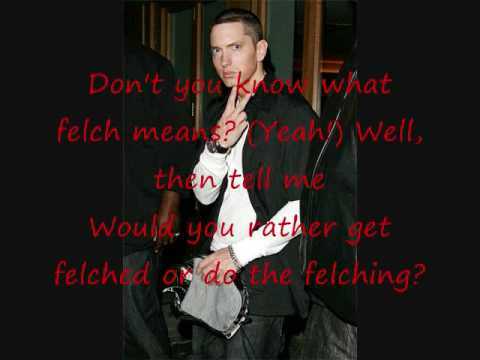 See the full Insane lyrics from Eminem. Insane lyrics belongs on the album Relapse. Learn every word of your favourite song and get the meaning or start your own concert tonight :-). Rate this song's lyrics. Uploaded by Isabel. Use it for personal and educational purposes only. Listen to these sick beats by Eminem. "Can't we just play with Teddy Ruxpin instead?" The next day my mother said, "I don't know what the f***'s up with this kid"
Man that motherf***ers gangsta, ain't he dog? Shady dog, what be going through that f***ing brain of yours? Say no more, what the f*** you waiting for? Sing along. Shady what the f*** you saying? I don't know help me! What the f***'s happening? I think I'm f***ing melting!